I mean, who wouldn’t love a wonderful morning with the soothing aroma of coffee with its perfect partner— an enticing vision of stacked, steaming golden pancakes dripping in maple syrup, right? Whether it be a quick Monday morning breakfast or a relaxed Sunday brunch, it is no doubt that pancakes are the most popular breakfast item across the world! Pancakes are among the easiest food item you can make for breakfast, however, it can be quite a challenge to get the right size, shape and fluffy texture you always want— especially if you need to cook several pancakes in just a short amount of time. I’ve got some good news for you, though! This very problem can be prevented with the best pancake griddle that allows you to cook several pancakes at a time without overwhelming your skillet and forgetting the fun of flippin’ those pancakes. How To Use Griddles For Pancakes? Is a piece of cookware or kitchen appliance with a flat and large surface. Griddles make cooking more efficient and easier and not only with pancakes. Most pancake griddles come in rectangular or square shapes, but some also have a circular shape. Rectangular and square-shaped griddles are ideal if you want to maximize the cooking surface you can work with. Additionally, rectangular griddles also allow you to cook other items other than pancakes, making it highly versatile. Another thing you need to consider is the size of your griddle. If you frequently entertain guests or has a large family to feed, then consider getting a griddle that is as large as enough room you can spare in your kitchen. This will allow you to cook more pancakes at the same time, getting the task done faster and ensuring that they are still hot and fresh when you serve them. If you live alone, then you can get a relatively small one for single servings. The most common griddle materials are stainless steel, aluminum, and cast iron. Stainless steel is durable and non-reactive, however, heat distribution can be a problem. Aluminum is the most affordable and lightweight of the three choices. It also has a fair heat distribution, however, it is highly reactive to alkaline and acidic foods. And because it is soft, aluminum tends to scratch and warp easily. Cast iron is the most durable of all. It has a natural non-stick coating, does not react with acidic foods, and distributes and retains heat really well. The only problem is that it is the heaviest among the three. Usually, pancakes are not that thick, so they tend to stick to the cooking surface. If you want a healthy pancake recipe, then go for griddles with non-stick pans since they require less to no oil than regular pans. Plus you will never have to serve any misshapen and ugly pancakes with non-stick coating griddles. Some griddles rely on electricity in order to heat while some are designed like pans that you need to place them on your stove top. Either style provides multiple sizes and high-quality options to choose from. If you are eyeing a griddle that is used on a stove top, then you need to take a closer look on its handle. You would want to get a stovetop pancake griddle with handles that do not heat while cooking in order to prevent accidents or burning your hands. Also, get a griddle with good gripping handles in order to prevent slipping when trying to flip your pancakes. If you opt for an electric pancake griddle, then you need to consider the heat settings. The best electric pancake griddle allows you to adjust the temperature from high heat, medium to low heat or can provide you with particular temperature settings. 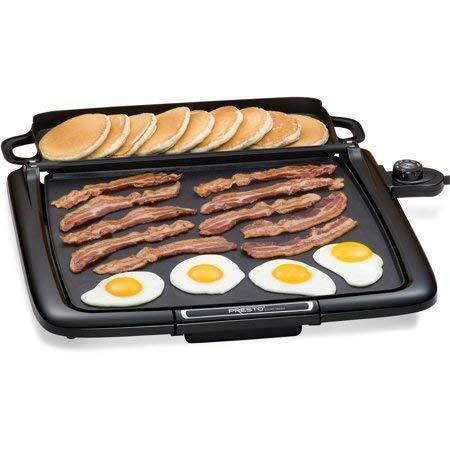 If you think about cooking other foods such as bacon, eggs or even steaks, then you can look for a griddle that offers additional plates with grilling surfaces. With this, you can enjoy the versatility of the item without spending a lot. Look for a pancake griddle that does not give you a hard time to clean. Pancakes are relatively easy to cook, so why cleaning up after the griddle should be hard? The best choices are griddles with non-stick surfaces or removable parts that make it relatively easy to clean. You should go for a pancake griddle that you can wipe clean without hassle. Last but not the least, you should carefully consider how much are you willing to spend for a pancake griddle. Spending more usually gives you a higher-quality griddle that surely lasts longer. Expensive models can even come with a longer warranty or easier to clean. Expensive options usually refer to electronic ones while the cheapest choices are typically stovetop griddles. 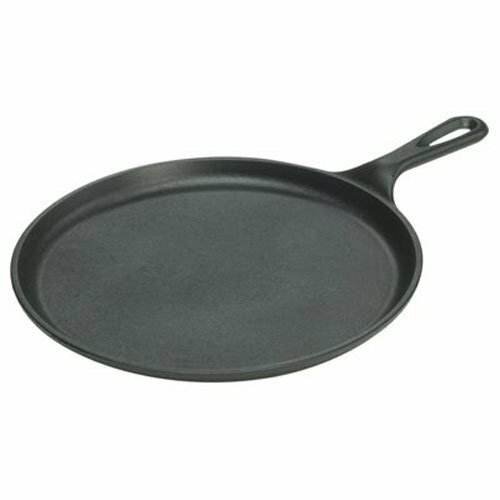 The Lodge Round Cast Iron is a 10.5-inch, multi-functional griddle which works wonder for your all-time favorites! It is essential for big breakfasts, flipping flapjacks and pancakes, roasted vegetables, quesadillas, tortillas, and grilled sandwiches. With a cast iron construction, you can use it on stovetop, campfires, as well as the oven and can be very tough and used for generations to come. It can slow-cook foods without scorching, plus it can retain and distribute heat very well, so you can even sear meat at a higher temperature. 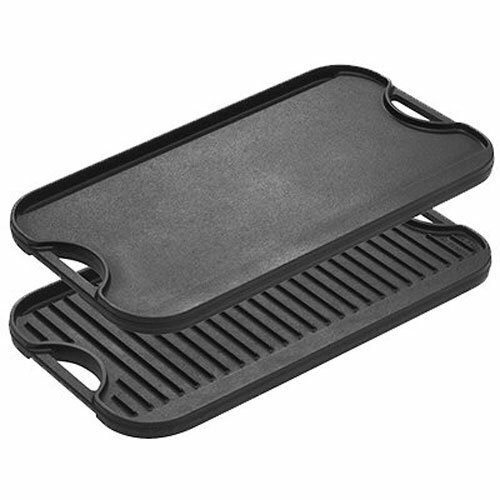 Sporting a stylish black color, this round griddle looks great in most kitchen and doubles up as an excellent source of nutritional iron when cooking. It also provides a non-stick surface without any harmful fumes generated by heating chemically-treated nonstick cookware. Another product from Lodge, this cookware can be used as a griddle or a grill. It provides great heat retention and distribution and can fit over 2 stovetop burners. Its easy grip handles allow you easily lift, flip or hang this cookware if not in used. Featuring a slight slope, it provides a generous grease gutter for a mess-free cooking. It reversible feature means that you use the ridged grill side for grilling sausages, steaks and hamburgers and the smooth side for cooking pancakes, eggs, flapjacks, and sandwiches. Whether you use it in a camp or kitchen, this iron cast cookware is virtually indestructible that could last for generations to come. Measuring 20 x 10.44 inches, you can cook enough food items for the family. It also comes pre-seasoned in order to prevent any food sticking on it, but you can still spray or coat it with vegetable oil. Moreover, cleaning is relatively easy— just run on water and dishwashing soap, pat dry with a towel and you’re good to go! Presto offers an efficient square-shaped electric griddle that can hold more sandwiches, eggs, and pancakes than conventional rectangular griddles! It features a multi-function tray that can be flipped back in order to keep cooked food warm and flipped up to use as a spatter shield, swing forward for steaming and melting and completely removable to be used as a serving tray! With a 14 x 15-inch cooking surface, you can cook batch-by-batch of food in no time! Non-stick coating ensures that you can easily clean the product and have a stick-free cooking. It also has a master control that allows you to control the temperature of the griddle for the desired cooking heat. Sporting a cool-touch base on both sides and front, you do not have to worry about your hands getting burned. It also has a slide-out drip tray for a mess-free cooking and easy cleaning. This griddles can be submerged fully on the water and is dishwasher-safe— just remove the heat controls first. Make pancakes every morning in this beautiful orange griddle pan that you will surely love. With a non-stick coating, the Gotham Steel Square Griddle Pan will make sure that you can cook and flip pancakes and eggs without any hassle! It comes in just the right size for cooking your favorite breakfast meals. It is PFOS-, PTFE-, and PFOA-free so you do not have to worry if it is safe for cooking. This griddle pan also offers easy cleaning, thanks to it being dishwasher safe, so you can just throw it in and not worry about a thing. Its sturdy handles allow easy lifting and transport of the pan. However, you need to exercise caution since it does not have any rubberized handle so it can very hot when cooking. Create smiling pancakes every morning that will surely brighten the day! This fun, emoji pancake pan makes it easy for you to cook presentable breakfast without any added efforts. 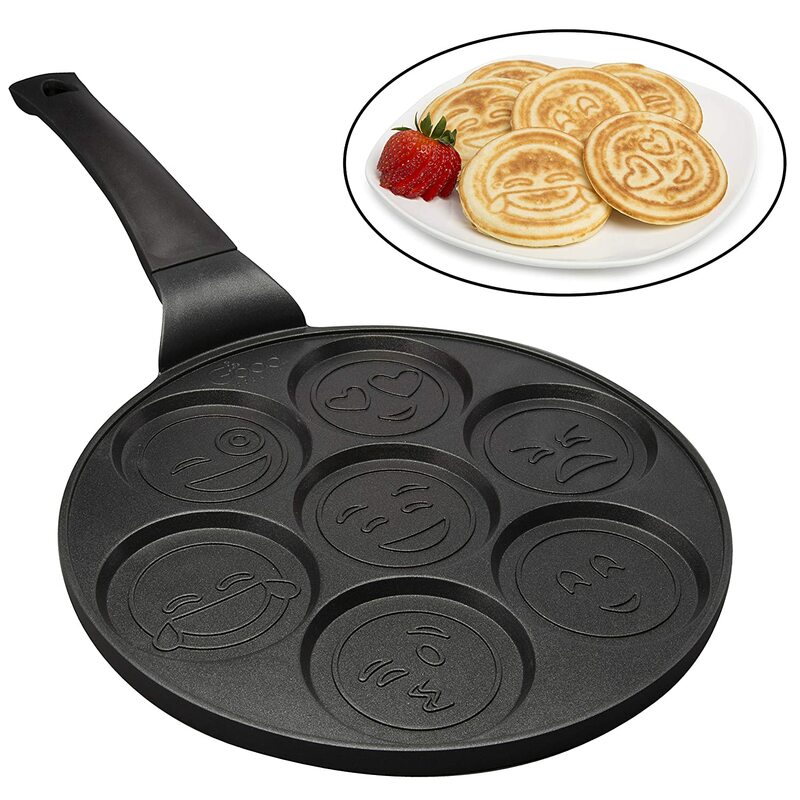 This pan features 7 different molds emblazoned with different funny emoji faces. It has a non-stick coating so that your food won’t stick on the surface and easily flip your pancakes if you can. It requires little to no oil when cooking and can provide you with 7 3-inch thick pancakes for your family. After cooking, you can easily clean it off with water and wipe it with a soft cotton cloth. Its size does not take up to much space in your kitchen and is very easy to store on kitchen cabinets. Once you have brought your own pancake griddle, making pancake is relatively easy! Although there are ready-made pancake recipes you can buy in stores, creating one for yourself is quite easy, plus you get to control the portion of seasonings and additives on your pancakes. Sift together the baking powder, white sugar, salt, an all-purpose flour. After mixing, create a well in the middle of the mixture. Add the milk, egg and melted butter. ​​​​​Mix all ingredient until it has a smooth and consistent texture without any lumps. For perfect pancakes every time, griddles are the best kitchen tool. Just pre-heat your griddle at 350 degrees Fahrenheit. In case you do not have any temperature options, then just put in on medium heat. Usually, griddles heat up within a few minutes. Pour the batter in a small circle, then slowly spread it to at least 3 or 4-inches thick. If you are cooking multiple pancakes, then place them at least 1.5 inches apart so that they do not spread into each other and form a clump. Allow the pancakes to cook. If you see small bubbles on the batter, then it is time to flip the pancakes. You can use a spatula to flip the pancakes or try to be pro-like and do a throwing flip for fun. After flipping, cook for another 2 minutes until you see a golden-brown color on all sides. Use a spatula to get the pancakes off the griddle. Top it with your favorite syrups, chocolates, fruits or ice cream or eat them together with eggs, bacon, and spinach. After cooking, wait until your griddle has cooled down before cleaning. Use gentle soap when washing and never use harsh scorching pad since it can leave scratched on the griddle or peel off the non-stick coating. Rinse the griddle with water. You can also just throw it on the dishwasher if it is dishwasher-safe and wait for it to finish. After that use vegetable oil in order to re-season the griddle before you store it. Just use tissue with oil and wipe it on the cooking surface. Now, among the 5 products mentioned above, the best of the best pancake griddle would be…Presto Cool Touch Electric Griddle! Although a bit smaller than other pancake griddle, the Presto Cool Touch Electric Griddle offers a lot of features that the other griddles on the list don’t have. Its multifunction tray is highly versatile and features a master control that allows you to control and manage the desired temperature when cooking. It also has a cool-touch base for burned-free cooking and slide-out drip tray for a mess-free cooking. Plus, this item is dishwasher safe or can be fully submerged in the water for easier cleaning. But if you need a larger pancake griddle to cook a large batch of meals, then Lodge Pro-Grid Grill + Griddle will not disappoint! With a pancake griddle by your side, cooking stacked golden-brown goodies dripping in golden syrup is much easier and full of fun! And griddles are not just for pancakes, you can cook a whole lot of other food items that will complete your meal! So, what are you waiting for? Get the best pancake griddle out there and start making you stack of favorite hotcakes! Do you have any question? Suggestions? Feel free to voice out your mind by hitting the comment section below! Until then, happy pancake flippin’! PreviousPrevious post:What Does Saffron Taste Like? Understanding Its Magical, Expensive Allure! NextNext post:The Top 5 Best Iced Tea Maker To Cool You Down On A Hot Summer Day!